I was back on the train 8:00 in the morning for the second leg of my trip. 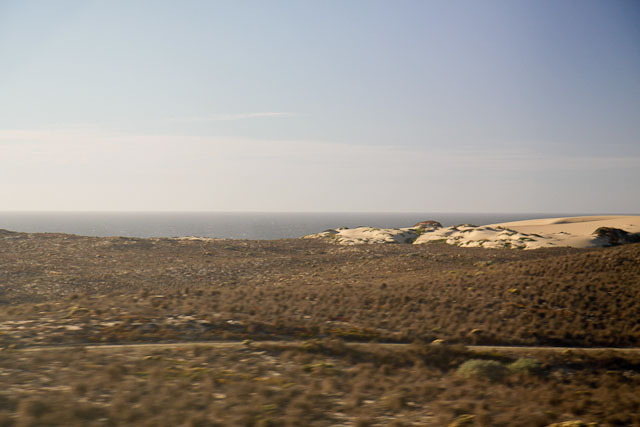 It was the Coast Starlight down to Los Angeles. I had a regular coach seat since this was not an overnight trip. The leg room puts all aircraft to shame. In fact, the foot rest was almost too far away. My traveling companion in the seat next to me was a woman from northern Australia. On all of my train trips, I met people from other countries who were enjoying “slow travel”. At dinner one night, a man from Ireland espoused the concept that the trip is all about the journey and not the destination. I’ve always tried to have that philosophy, though sometimes it takes a back seat. 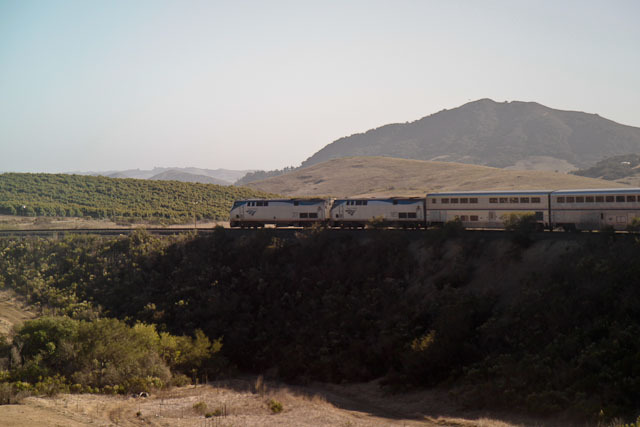 The Coast Starlight heads south, going through Oakland and San Jose. The trained was mooned by some men in their backyard. In fact I saw a lot of backyards. Our society buys and accumulates a lot of crap and it seems to accumulate in backyards. I also saw a lot of homeless living in makeshift shelters. I saw pristine walled communities with graffiti and homeless on the rail side of the wall. 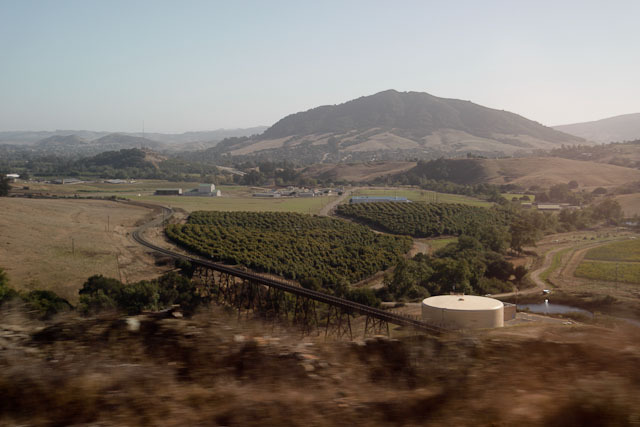 Later the train heads into agricultural areas of grapes and fruit trees, then smaller plants that could have been strawberries. A woman in the observation car joked that they should have signs next to the fields telling us what was growing there. 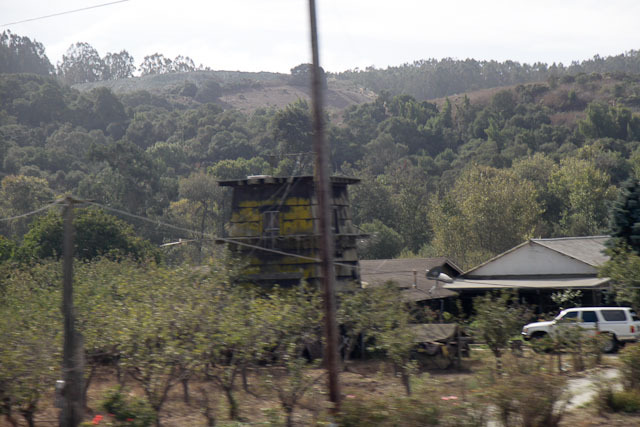 A ranch with some grapes and fruit trees. North of San Luis Obispo near Cal Poly. The train will be passing over the bridge below. Opposite of the Zephyr, the Coast Starlight had the coach cars at the rear of the train. This makes photographing the front of the train easy. Those are probably orange groves on the left. First glimpse of the ocean and sand dunes. At my dining car table, watching the coast go by. I felt like a VIP as I ate my steak dinner while watching the sunset over the ocean. We pulled into Los Angeles Union Station a tad early, just before 9 PM. I needed to change trains to continue farther south to San Diego county. The Pacific Surfliner wasn’t due until 10:10, so I had some time to kill. Seats in the waiting area. 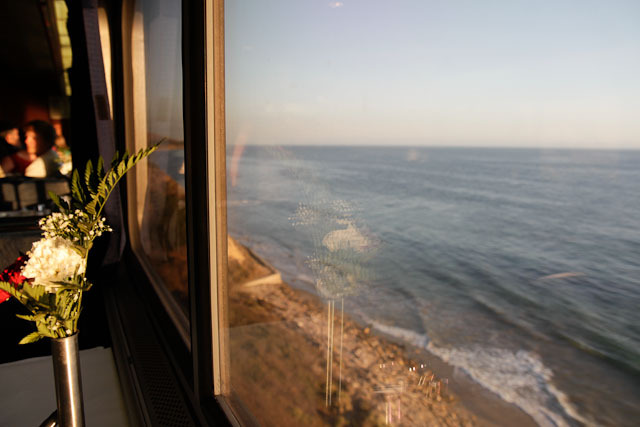 The Pacific Surfliner ends up right along the coast again near San Clemente. Unfortunately, it was dark outside and I couldn’t see it. My dad met me at the train station near midnight. He was getting over the flu and I didn’t want to take any chances, so the next day I change some plans around and stayed at my mom’s house. More to come. I have traveled to Grand Junction from Martinez more than once. We took the family on the Coast Daylight. I have done the other part from Washington to Martinez. It is so beautiful. FYI if you have a sleeper car on the Coast Daylight you get to have a wine tasting as you enter San Luis Obispo. It is the best way to travel because it is the journey. There’s also a wine and cheese tasting in the observation car northbound on the Coast Starlight between San Jose’ and Seattle. As to what grows south of the SF Bay area, beside grapes (as in the story “The Grapes of Wrath”), there are acres and acres of artichokes and then Gilroy, CA, is called the “garlic capital of the world” – you can smell it in the air! 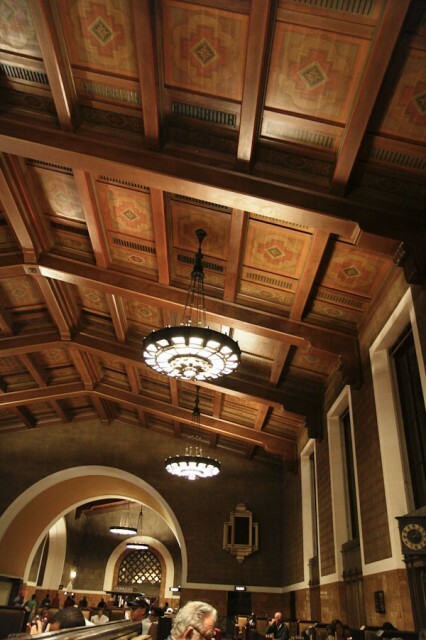 I’m pretty sure Union Station in L.A. was used for the interior police station shots in Blade Runner. It’s been so long since I’ve seen Blade Runner. I should add it to my queue again. 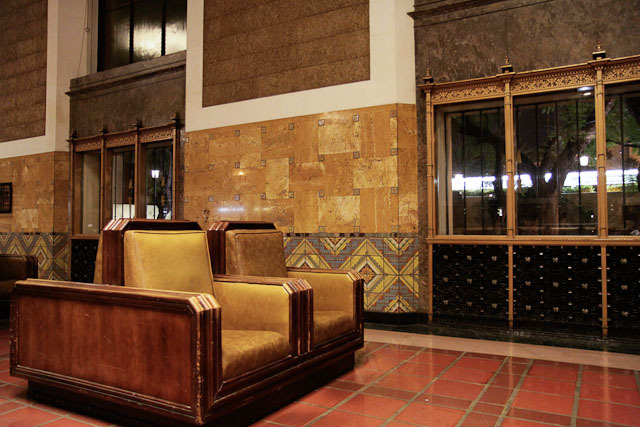 And… there’s a huge section of LA’s Union Station that’s roped off and not used for anything. The old ticket windows are still there.